Music for hotel lobby and common areas is made simple with SiriusXM Music for Business. Background music for hotels has a great number of brand standards to adhere to, and your property deserves the right audio to make your guests feel comfortable. 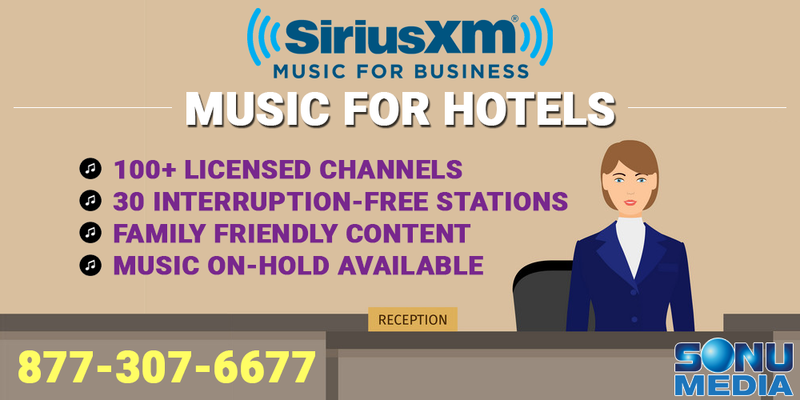 SiriusXM Music for Business offers over 100 licensed streaming channels of popular music for hotels and motels. 30 of those channels are curated without any DJ commentary or commercial interruptions. Just the right type of music playback to set the mood for your guests. SiriusXM for hotels is easy to setup, and simple to run. Every activation comes with a free mobile app, allowing immediate public play of your licensed music for business account. Additionally, professional business radios are available for a more feature rich music for business experience. The Grace Digital GDI-SXBR2 radio takes up minimal space, but packs a lot of great station selection and audio customization abilities. The GDI-SXBR2 will allow your property management staff to set the audio levels with an on-board equalizer, block channels you do not wish to be played, lock the channel currently playing, set up to 10 presets for easy mood changes, and much more. The SiriusXM GDI-SXBR2 internet radio also allows your hotel to use your SiriusXM for business music over the phone. Greet your current and prospective guests with the best music on-hold selection possible. One properly placed business radio is able to supply licensed streaming music to both your lobby and PBX phone system simultaneously. Create a cohesive musical branding of your hotel lobby experience for every guest your property encounters. SiriusXM Music for hotels offers fully-licensed streaming songs from over 60 years of hit music. All royalty payments and processing for ASCAP, BMI, SESAC, and GMR are taken care of for you by Sonu Media. Once activated, you can rest easy knowing all of your property’s music will remain completely legal for commercial play. Every major genre of music is represented, and each channel is currently playing the artists your guests already know and love. Family Friendly channels are clearly marked to provide a safe audio atmosphere to all demographics visiting your hotel, or calling for more information. The SiriusXM interruption-free channels alone cover multiple decades of Pop, Classic Rock, Alternative Rock, Electronic Music, Country, R&B, Jazz, Motown, Soul, Latin Pop, and more. Holiday channels are also provided every year to theme your common areas just right! Celebrate New Year’s Eve, Christmas, Hanukkah, St Patrick’s Day, Cinco de Mayo, 4th of July, Valentine’s Day, and many more with both dedicated channels and special broadcast events. Sonu Media is also able to supply your hotel or motel properties with professional automated promotional messaging integration. Our state-of-the-art USB messaging technology takes your branded voice promotions and seamlessly shuffles them into both your audio system and music on-hold. Inform your guests, visitors, and callers about current room rates, special events, holiday celebrations, and everything else your hotels have to offer. Changing promotions is as simple as uploading a new mp3 audio file to a standard USB stick. Take advantage of limitless sales opportunities without expending more time and energy. Call 877-307-6677 to speak with a live representative about activating SiriusXM Music for Business at your hotel or motel property. You can also use the button below to request a free quote, and send us your specific needs. Sonu Media is dedicated to providing your hotel with the right commercial music and equipment for a complete audio solution.